Today is a very special day. Not only is March 20, 2018 the first day of Spring; but it is also National Ag Day, a day of appreciation for the agriculture industry. National Agriculture Day was organized by the Agriculture Council of America to educate the public about the importance of agriculture in our daily lives. Growing organic goods is a skill that requires dedication, long working hours and care; but the final product is rewarding in so many ways. Eating organically is better for your family and can provide a family of four with over a month's worth of fresh vegetables. Celebrate National Ag Day today by planting spring vegetables in your garden. There are many types of spring vegetables to plant including greens like kale, lettuce and spinach. Additionally, gardeners can plant carrots, radishes and beets now. 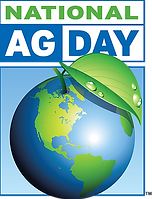 Join the Ag Day movement today and get begin growing this spring! #NationalAgDay.